With the 2018 NFL regular season complete, New Orleans Saints head coach Sean Payton finished No. 1 in Head Coach Ranking. Payton, who was tied for the top spot in 2017 with Bill Belichick and Sean McVay, ranked No. 1 this season with a grade of 8.0. The Rams’ McVay and Andy Reid of the Kansas City Chiefs finished tied for second at 7.9, while John Harbaugh of the Baltimore Ravens was fourth at 7.8. • The highest-ranked rookie head coach was Matt Nagy of the Chicago Bears, who earned a grade of 7.7 – fifth overall – after leading his team to the NFC North crown. Nagy wasn’t the only rookie head coach in the top 10 — Frank Reich of the Indianapolis Colts finished tied for eighth in HCR at 7.4. • Only one coach in HCR’s top 10 did not make the playoffs: Cleveland Browns interim head coach Gregg Williams, who finished seventh overall at 7.5. • The lowest-ranked head coach among the teams that are in the playoffs is Doug Pederson, tied for 18th with an HCR grade of 6.9. When the Eagles won Super Bowl LII last season, Pederson was ranked sixth overall with a score of 7.4. 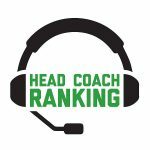 • Of the eight head coaches who were fired this year, the two that finished highest in the rankings were the Cincinnati Bengals’ Marvin Lewis and the Denver broncos’ Vance Joseph. Those two finished tied for 18th with a grade of 6.9.